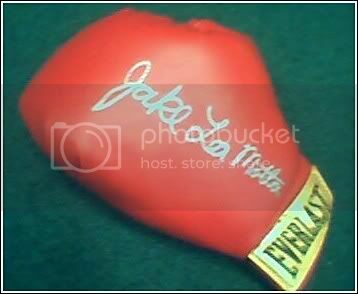 PC Tony dropped by the station today to drop off the boxing gloves that his uncle, Jake LaMotta signed for Winterfest. Also today I had the opportunity to interview Jake. We talked about his career, and boxing today. There were things that I wanted to ask, but we never got there. Oh well. If you'd like the opportunity to own the glove below, buy a raffle ticket at a local drinking establishment or buy a ticket to see Rocky III this Saturday at the Palace Theatre as part of the Winterfest fun. Extreme Kudos to PC Tony for all he's done. Much love and more later.